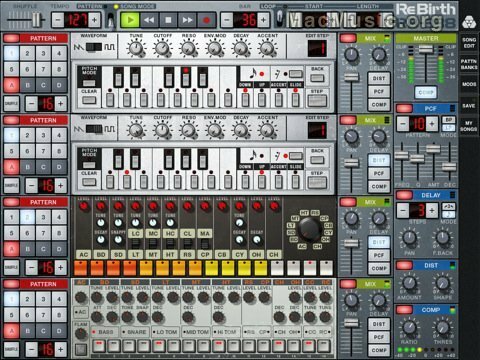 ReBirth literally puts faithful emulations of dance music's vintage analog hardware at iPad users' fingertips: the Roland TB-303 Bass synth and the TR-808 & TR-909 drum machines. Simple step sequencers based on the original hardware assure that anyone stays on the beat. iPad multi-touch support provides an easier and more functional experience than on the originals. Great sound effects with an interface that encourages experimentation will have users instantly creating hit-worthy Techno, House and Hip-Hop beats. And, because music is a social activity, Rebirth offers simple one-click posting of tracks to Facebook and collaborating with other ReBirth users.